Marine Cpl. Jonathan Dowdell and his wife, Rebecca, walk up the driveway of their new Tuscan Lakes home for the first time. After undergoing multiple amputations caused by an explosion while serving in Afghanistan and completing an exhaustive rehabilitation, U.S. Marine Cpl. Jonathan Dowdell, along with his wife and daughter, are finally home in League City’s Tuscan Lakes community. A custom-built, mortgage-free home by Harbour Classic Builders was presented to the Dowdell family at a ceremony hosted by Operation Finally Home, a nonpartisan/nonprofit organization established in 2005 to provide custom-built, mortgage-free homes to America’s military heroes and the widows of the fallen, those who have worn America’s uniform and sacrificed to defend our freedoms and values. 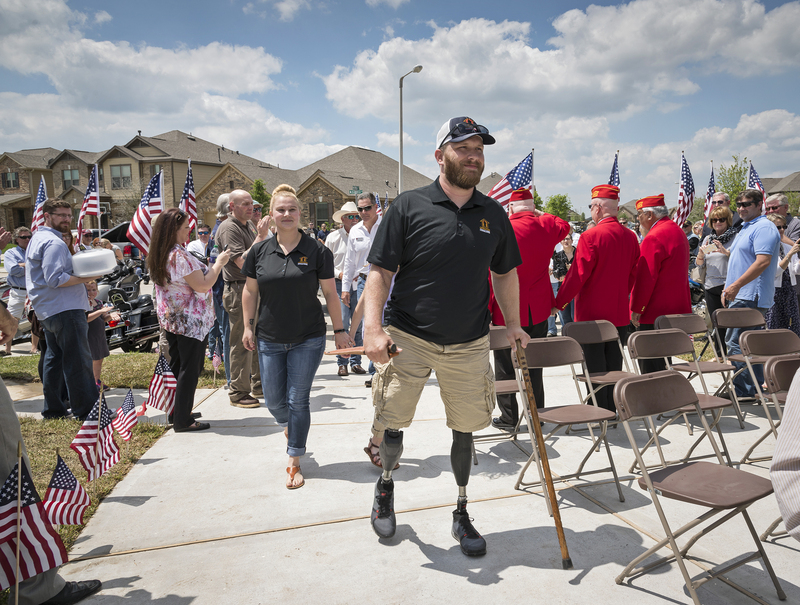 The Dowdell home marks the fifth mortgage-free residence presented by Operation Finally Home to a wounded veteran in Tuscan Lakes and 100th nationwide. Ironically, the non-profit organization started in the Bay Area back in 2005 with the completion of a small remodeling job for a wounded veteran. A Color Guard and remarks from local dignitaries followed the official presentation of the keys to the Dowdell’s new family home. After the family toured their new home for the first time, those in attendance were able to experience this beautiful retreat built specifically for one of our nation’s military heroes. Tuscan Lakes, a master-planned community by The Johnson Development Corp., is conveniently located in League City between downtown Houston and Galveston Island on League City Parkway (SH 96), just three miles east of I-45.